Pastor Ervin Williams of Urban Restoration Ministries poses for a portrait in the main sanctuary. By Candice Norwood — The Rev. Ervin Williams loves Sunday night, the rare time when he can stop, relax and listen. As the founder of Champaign’s Restoration Urban Ministries, his work week is long and often divided among preaching three church services, running staff meetings and teaching classes aimed at helping the 120 homeless residents the ministry has on average in its Transitional Housing Program. 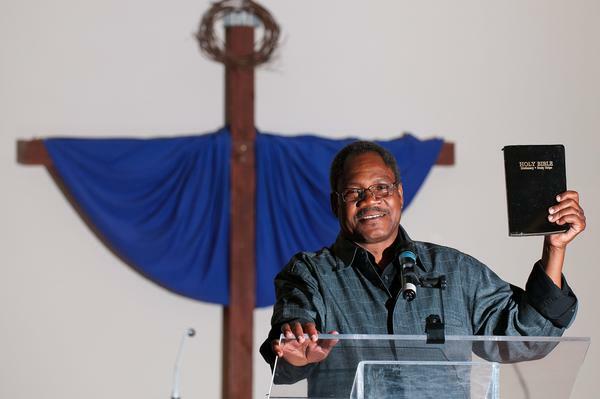 Yet each Sunday, he and a handful of congregants gather inside Restoration’s sanctuary for worship and testimony. During the morning service, the sanctuary’s 60 chairs might be full. Tonight, there are 14 people. Sitting in the front row near the center aisle, Williams wears a navy blue suit, V-neck dress shirt and worn, black leather shoes. A strikingly calm, soft-spoken man, he often appears tired and older than his 62 years. He sits quietly, in concentration, with his head tilted toward the sky, his eyes squinting.